The Svelte furniture range is sleek and versatile with units coming in various sizes to suit any bathroom layout. This two drawer vanity unit and basin comes in a beautiful Eucalyptus finish and features sumptuous curves. 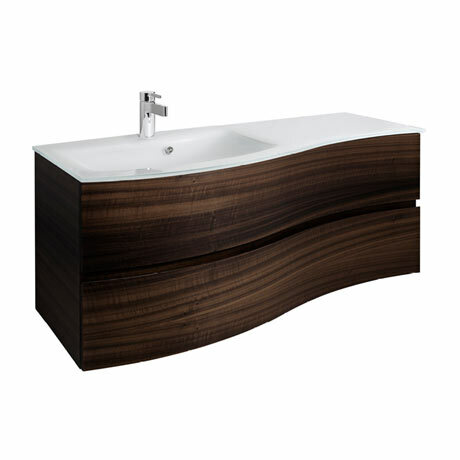 Its handleless design gives it a simplistic look whilst the anti-bacterial finish gives a clean and hygenic surface. The exquisite cast glass basin tops the unit reflecting light in a crystal clear finish. Made from thermal hardened glass, it comes in an Ice White finish and features a single tap hole and overflow.